In general, and I speak from bitter experience, it is not much fun being early on a trade - even if that trade is ultimately successful. The dreaded career risk dictates that it is better to go with the flow and either go off the edge with everyone else (‘performance whilst disappointing was in-line with peers’) or time an exit to perfection. It is likely that many hoping to execute the latter find themselves doing the former. This may be particularly relevant currently with bond yields so low and so many investors expecting them to rise. These investors claim to have shortened duration – by selling to central banks and pension funds – but if they are planning to shorten duration further it’s unclear who the next supplier of liquidity will be. A recent Bank of England Staff Working Paper, ‘Investor behaviour and reaching for yield: evidence from the sterling corporate bond market’ puts a bit of meat on these thoughts. The authors analysed data of secondary market corporate bond trades between 2011 and 2016. They concluded, with the help of some scary looking formulae, that insurance companies, hedge funds and asset managers are typically buyers of corporate bonds as yields rise. However, in times of market stress this behaviour is turned on its head and the same group of investors typically sells, perhaps because of liquidity issues (i.e. redemptions). Historically, these sales have been offset by banks stepping in to provide liquidity. The authors also found that the potential for instability has increased with investors ‘reaching for yield (by, for example, buying the highest yielding bond for a given credit rating) to meet their obligations to clients whilst keeping within regulatory roles. The authors are silent on whether changes in bank regulations may make it more difficult for the banks to enthusiastically offer liquidity in stressed markets. 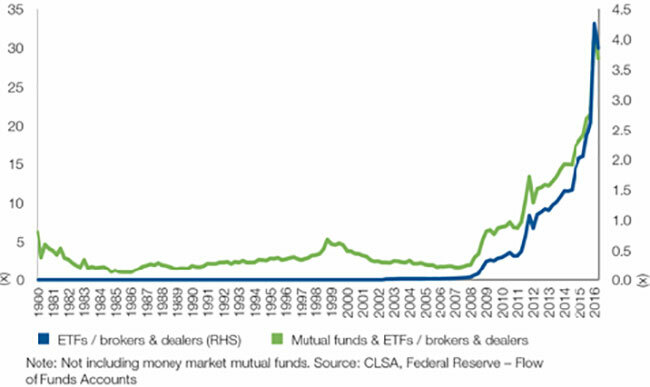 They also fail to highlight the huge expansion in bond holdings held by institutions relative to the size of bonds held by banks (as seen in the slightly dated, but still relevant chart below). These are all factors which those dancing close to the door should bear in mind. My sense is that whilst investors believe that bonds are over-bought they fight outright bearishness because they claim we are living in a ‘low inflation rate, low interest rate environment’. We are constantly reminded of the apparently obvious mega trends such as globalisation, technology, demographics and weakening of unionisation that have driven and continue to drive this dis-inflation. However, it’s worth reminding ourselves these shifts are often much better explained with hindsight. Will these trends continue to keep a lid on inflation? Forecasting macro-economic variables has typically proved a frustrating exercise for most investors, but perhaps placing current bond yields in a long-term historic perspective can help frame a discussion on where bond yields might be heading. 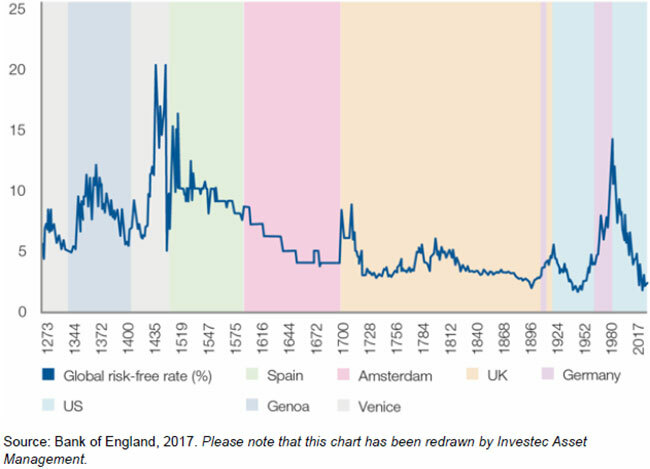 Another recent Staff Working Paper from the Bank of England, ‘Eight centuries of the risk-free rate: bond market reversals from the Venetians to the ‘Var’ shock’, provides some very useful information in this regard. The author, Paul Schmeling has found bond yield data going back to the 1200s reproduced below. His conclusion: that when the US 10 year bond yield hit 1.37% in mid-2016, the series hit its 800 year low. He also looked at real yields (with the help of 800 years of inflation data) and found real yields at July 2016 were sitting at the 95th percentile of historic experiences. Over those 800 years Schmelzing identified nine secular bull markets of which the current one is the second most intense (most significant fall in yields) and the second longest. The long-standing 1441-1482 record remains safe for now. Schmelzing then moves on to bond market reversals and analyses three which occurred in the 20th century. The 1965-70 ‘fundamental reversal’ (bond prices fell 36% - ignoring coupons received) is interesting as It followed a numberof years of low inflation and started at a time when investors had a ‘lower-for-longer inflation rate consensus belief’. This proved mistaken as the consumer price inflation index rose from 1.1% in January 1965 to 6.4% in February 1970, having never been above 2% since October 1958. And, the author points out this wasn’t driven by food or energy, but by core items. The 1994 ‘bond massacre’ saw bond futures fall almost 21% from peak to trough in just over 12 months. Bond market historians apparently disagree on the reasons for the bear market although the February 1994 Fed Funds hike, the first for almost 5 years, invariably takes a lot of the blame. Economic activity was strong, but inflation expectations were stable and the move was seen as pre-emptive so the room for disagreement is obvious. Perhaps our old friend complacency when coupled with a bit of inflationary fear set off a very nasty correction. It is interesting to note that inflation didn’t spike (as some had feared) and real yields peaked at a rather extraordinary level above 5%. The 2003 ‘VAR shock’ or ‘curve steepening reversal’ was short and sharp, centred on Japan and saw very low yields reverse less than 100bp and, perhaps a bit like 1994, seemed to create its own momentum. As bond yields began to rise, this affected banks’ risk calculations and they were forced to sell bonds thus pushing bond yields even higher. It is always dangerous to look too hard for patterns especially from so few data points, but these reversals illustrate what can happen when low starting yields, investor complacency, forced selling and momentum trades all come together. With bond yields still at the extreme end of their 800 year history the risk for investors look extremely asymmetrical. All rights reserved. Issued by Investec Asset Management, issued October 2017.